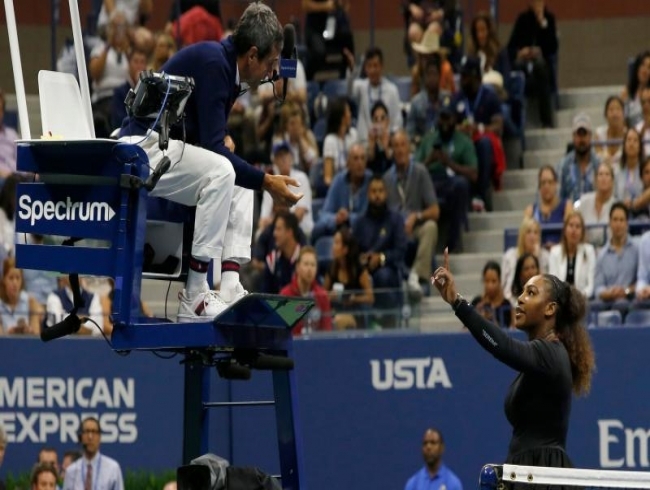 New York: Spawned by sexism or not, Serena Williams's run-in with chair umpire Carlos Ramos in a tumultuous US Open final loss to Naomi Osaka had tennis officiating in an unwanted spotlight once again. Williams, whose bid to match Margaret Court's all-time record of 24 Grand Slam titles was at least temporarily thwarted by Osaka's 6-2, 6-4 victory, made no bones about her belief that sexism played a role in the code violations handed to her by Ramos -- which added up to a point and a game deducted and a $17,000 fine. "I've seen other men call other umpires several things," said Williams, who called Ramos a "liar" and a "thief". "He's never taken a game from a man because they said 'thief'. For me it blows my mind. But I'm going to continue to fight for women." "We do not believe that this was done (Saturday)." That question, coming on the heels of questions over scheduling of women's matches at the Australian Open and widely criticized remarks by French Tennis Federation President Bernard Giudicelli suggesting the "Black Panther" catsuit Williams wore at the French Open was somehow "disrespectful", has intensified debate on gender bias in the game. But Williams isn't the first player to take issue with Ramos's strict interpretation of the rules. Andy Murray received a code violation from Ramos at the 2016 Rio Olympics after Ramos alleged the Briton called him a "stupid umpire". Novak Djokovic, who won his third US Open title and 14th Grand Slam crown with a straight-sets victory over Juan Martin del Potro on Sunday, said he didn't agree with Simon's assessment. "But I have my personal opinion that maybe the chair umpire should not have pushed Serena to the limit," he said. "Especially in a Grand Slam final. He did change the course of the match. It was, in my opinion, maybe unnecessary. We all go through our emotions, especially when you're fighting for a Grand Slam trophy." American CoCo Vandeweghe, who teamed with Australian Ashleigh Barty to win the women's doubles title, said she thought it was "ridiculous" that Williams was docked a game. "I thought it was a poor call from the umpire," she said. "I think the umpires, they antagonize a lot of players. There's certain ones that need to be checked. I've dealt with the wrong side where they think they hear something, they don't hear something. The whole crowd thinks you're the screw-up, which is incorrect. "I think they need to be held accountable." Ramos wasn't the only umpire under fire in the final Grand Slam of the year. The US Tennis Association admitted the umpire got it wrong in issuing a code violation to France's Alize Cornet for quickly removing her shirt on court when she realized she'd put a fresh one on back to front -- another embarrassing incident with sexist overtones. And the USTA said Mohamed Lahyani "went beyond protocol" in climbing down from his chair to urge Kyrgios to try harder in a match against Pierre-Hugues Herbert, the Australian then turning things around to book a third-round meeting with Roger Federer. Djokovic said players in general appreciated Lahyani's more open handed approach, but he could see why Herbert was irked. "A chair umpire should be neutral," Djokovic said.